Reunion of Spiritual Guides in Sonora, Mexico. Guarijio are battling a proposed dam that could force them to relocate. 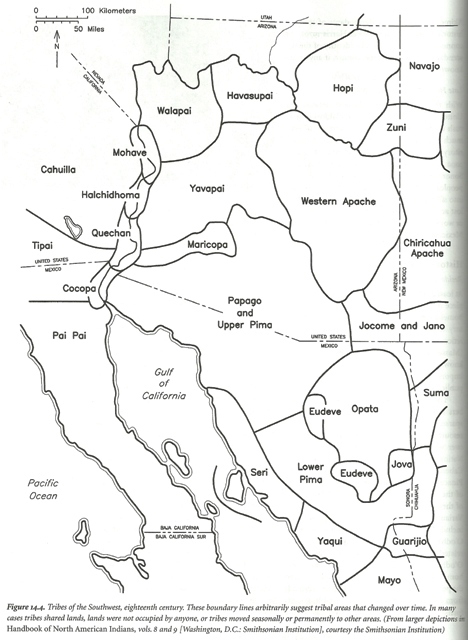 Los O´odham y los grupos indígenas de la región noroeste. Fuente: (Felger y Broyles, 2007, p. 134). Cu:Wi I-Gersk, Sonora, Mexico -- The Traditional O’odham Leaders of Sonora, Mexico are again astounded that the Mexican Government at this time of technological advancement has not acquired the basic principles of honesty and civilized decency in existence with the natural world. As within our region time and time again development is being permitted without respect or proper consultation to the local population. Development moves forward without transparent compliance to the cultural, environmental and biological statutes enacted by the government of Mexico. The Traditional O’odham Leaders of Sonora, Mexico represent the O’odham communities of northern Sonora, Mexico, and are recognized as the official representatives sanctioned by the O’odham community members, and recognized by the State and Federal government of Mexico. The Guarijio have not been properly informed or afforded proper consultation with respect to transparent information regarding detailed project plans of the Los Pilares / Bicentenario dam project on the upper River Mayo in southeast Sonora State and the Guarijio have not been properly informed or afforded proper consultation of studies outlining negative impacts that will interrupt their livelihood. The Guarijio have been affected by being targeted with unfair local and regional media (press and television) reports that they are “opposed to development” and the projects reputed benefits. The Guarijio are being judged publicly without the benefit of being properly informed or afforded proper consultation with respect to transparent information regarding detailed project plans of the Los Pilares / Bicentenario dam project on the upper River Mayo in southeast Sonora State. The Environmental Impact Analysis (EIA) fails to include significant social and environmental impacts. The Guarijio were not properly informed or afforded proper consultation with respect to the transparent information regarding detailed project plans of the Los Pilares / Bicentenario dam project to include participation and contribution of the Guarijio in the EIA to assist in the identification of significant cultural, social, biological and environmental impacts that the Los Pilares / Bicentenario dam project twill have on the existence of the population in the region. Identical to the O’odham, the Guarijío as well as Pima and Mayo peoples have populated this region since ancient times. The indigenous culture, traditions and lives depend upon the resources of the region such as the water and associated ecosystems that are essential for the livelihood to survive. The impacts of the proposed dam include physical displacement of homes and communities gravely impacting historical and cultural heritage. The proposed dam project will destroy the natural resources that provides for food and medicinal resources as well as traditional building materials which are now available to the community. The Traditional O’odham Leaders of Sonora, Mexico fully support the Guarijío and encourage solidarity with all our relatives of the region to work in unity to protect our rights as indigenous people and our responsibilities to the land and the universe. 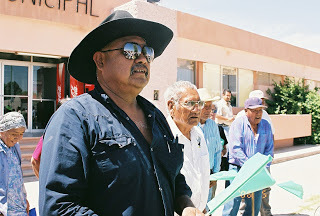 Los Líderes Tradicionales O’odham de las Comunidades O’odham de Sonora, México, en apoyo al Pueblo Guarijío, nos han hecho llegar la siguiente Declaración.